While many organisations have implemented service-oriented architecture (SOA) governance to optimise their delivery of services, tremendous practical challenges persist at different organisational stages. The existing literature illustrates the concepts of enterprise SOA and the adoption of SOA governance in a variety of contexts. Many SOA governance models have been developed and introduced based on specific organisations’ requirements, strategies, responsibilities and orientation processes. However, SOA governance models are abstract and lack structure and best practices, making it difficult for them to be generalised and adopted in reality, especially in the context of e-government. Only a few studies use e-government to contextualise the Critical Success Factors (CSFs) in SOA governance adoption. 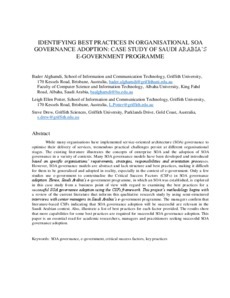 Hence, Saudi Arabia’s e-government programme, in which an SOA was established, is explored in this case study from a business point of view with regard to examining the best practices for a successful SOA governance adoption using the CSFs framework. This project’s methodology begins with a review of the current literature that informs this qualitative research study by using semi-structured interviews with senior managers in Saudi Arabia’s e-government programme. The managers confirm that literature-based CSFs indicating that SOA governance adoption will be successful are relevant in the Saudi Arabian context. Also, illustrate a list of best practices for each factor provided. The results show that more capabilities for some best practices are required for successful SOA governance adoption. This paper is an essential read for academic researchers, managers and practitioners seeking successful SOA governance adoption.